Player’s Choice Godfest (PCGF) has been announced for North America and the polls are open from 12/7 – 12/11. Each player can cast a single vote and there is no way to cancel or change your choice once submitted, so please choose carefully. Player’s Choice Godfests are a rare and special occasion and I want to provide some clarification and advice to make your vote count. During a Player’s Choice Godfest, everyone is able to to vote on their favourite God and the top 25 will be featured in a special Godfest. Furthermore, Godfest Exclusives that are not voted in will be unavailable during this time. You can cast your vote HERE. Vote for what can benefit you the most. Just because Krishna is a dream leader for some people, it does not mean you should be voting for him if it cannot benefit you. You should vote for the God that can benefit your box the most. This can come in the form of a new leader or key sub for your favourite team. Think about what is being released in the next few months. Do you have a strong Ra Dragon in the making? If yes, it would be wise to vote for one of his ideal subs. Due to the rapid rate of Powercreep, you ideally want to have cards that are currently powerful. Voting for outdated cards can be wasteful as they may not make it in along with causing possible disappointment when rolled as they lose their value much faster. 6- star Godfest Exclusives have very low rates and if your primary goal is acquiring these, it would be best to wait until a 5x GFE event or the special 10-stone REM. Granted this is a small sample size, but the rates of the coveted 6 star GFE are distressingly low. You can read more about the previous PCGF in my other post HERE. If anyone has a link to a larger sample size, please let me know. Hey man, maybe I’m missing something, but a lot of the meta-decision making you talk about (i.e. voting for an underdog) doesn’t work if you can’t see the voting results live. Is there some way to see that this PCGF? Because it seems like they changed the system to avoid shenanigans from the past. Looks like you are right and I simply deleted that section. Cool, looks good. I’m curious if someone figures out how to scrub the data like they’ve done in the past. Great info on the distressingly low 6* count. As a result of this info, I’ll probably sit my main account out of this one. After all the spending I’ve done, I don’t really need anything at all but a couple gem princesses and some more 6*’s, besides obscure collab exclusives. Now my alt on the other hand..
What are you going to vote for? I am at rank 205, and have many rainbow leaders, including Sakuya, Kali, Lightning, and SSIsis. There are many monsters that I want, such as ReHades, and ReMinerva, but I don’t know what I want. A little off topic (Just curious) What defines which is the “Main” account? Our first account, the account that have the best box, higher rank or the account we like the most? Considering that I play both accounts in the same proportion. I have almost all monsters I want except Saria and kaede, it’s better to wait a 5x GFE even if the two monsters are in the PCGF ? Ok, I mean GFE will have more chance to appear during 5xGFE but there are plenty of other GFE… Are you sure of what you said mantastic ? 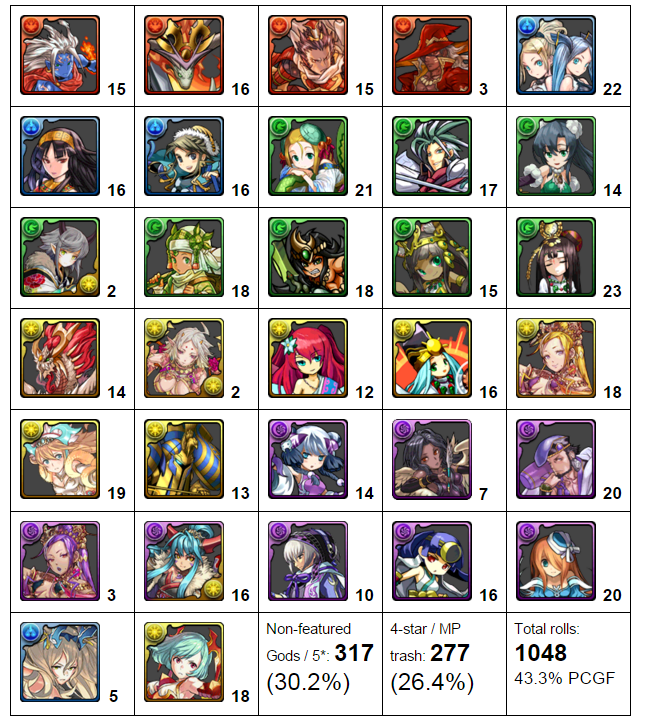 I really want a Paimon, he not one of the rarest 6-stars, but he would be good as 40% of my rem monsters are light, including Sakuya, Kali, Hathor, Saria, Lightning, and other whatnot. But if he does appear on the PCGF, should I roll for him as I have 70 stones, or should I wait for 5x, whichever has a higher roll rate. Is he even out in US yet? I also have 30% water and 29% dark, wood and fire are basically nonexistent in my box, except for Antares and GrOdin. Dark includes Oku, DMeta, AYomi, AVritra, APandora, and water includes Sarasvati, Sherias, MMotonari, 2x Andromeda, AIsis, and SSIsis. Sorry, I just don’t know what I should vote for. Paimon has the same roll rates as any 6-star and if your main goal is acquiring him, it would be best to wait for a 5x GFE event. However, it sounds like your monster box can be greatly improved upon and rolling in PCGF may be the best option. As for your vote, which team do you currently enjoy the most? I use LKali most commonly.